Parents are the living example from whom kids learn many things; then why not money management. However, one should ensure transparency and clarity in their instructions. Teaching their children how to manage money is an accomplishment parents must strive to achieve. 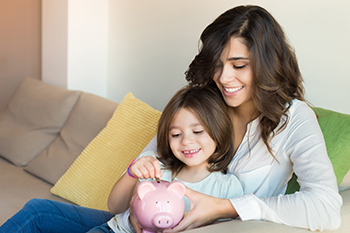 Learning to manage one’s finances from a young age can one help reap big financial rewards later in their life. Parents are the living example from whom kids learn many things; then why not money management. However, one should ensure transparency and clarity in their instructions. If you are struggling to explain the importance of money to your child, this article should at least help you get started. Once they have reached a certain age, children should be made to participate in grocery shopping. This way, one can teach them the basics of budgeting, like how much money is to be kept apart for essentials and how much for the miscellaneous and so on. This is also a great way to show them how the market works. Use this opportunity to teach them about products and the differences between brands. However, good parenting includes letting the child learn on their own even if they stumble at first. Send them on buying trips with a little extra money so that they can calculate the exact change they should get back. Show them how you set aside funds for monthly bills and other expenses. Moreover, as gut-wrenching as it sounds, parents should have the ability to say no to their children if they are being careless with money. Tough love is very important when it comes to inculcating financial discipline. These practices will give your child a general idea of the concept of finance and money management. Nowadays, smartphones are a staple product in everyone’s lives, be it a 10-year-old or a 50-year-old. In attempts to keep up with the trend, and, of course, with the intention of fulfilling their desires, many parents give their children smartphones. However, children should also be taught to make proper use of the technology. Start with installing some learning material and some money management applications on the phone; these apps can help the child keep a track over their allowances as well as use the technology efficiently. When given a monthly or a weekly allowance, the kids can determine their spending habits and prioritize their needs and wants. Accordingly, if your child wants something worth $30, and his/her allowance is only $15 a month, then ask him/her to keep aside $5 every month until the money grows to be $30. This method will teach them saving as well as budgeting. Also, many parenting coaches advise giving money to kids only when they complete a assigned task on time. This way, the child understands that money is to be earned. Having their own bank account, encourages children to deposit their savings in the bank. Moreover, extra money earned by way of completing household chores can also be deposited in this account. The idea is to teach them to save. Once the children get into the habit of saving, then managing finance becomes very easy. Giving your kid an add-on debit or credit card is a great way to teach them about managing finances and money. As kids grow up, so do their social and school activities. It is best to start your kid with a debit card as it limits excess spending. Another benefit of this is that a card is also a safer thing to carry than cash. However, if you are giving your child a credit card, do ensure that they understand that the amount spent is to be paid back with interest. Kids should not only learn to save as part of money management, but they should also know how to make their money grow. Parents can educate children about the various investments methods and their pros and cons. Moreover, try including them in decisions like planning for the next vacation or buying anything that involves a good deal of money. This will make them feel more important, and will motivate them to be more mature about money matters. Making kids recognize the importance of money and its management is an essential part of parenting. To reiterate, learrning to manage finances from a young age will not only inculcate discipline, but will also ensure that the child goes on to lead a comfortable life.